If you have tried before to put together an eBook with your own photos from scratch, you know that, unless you have experience or you like to tweak, the creation process can be kind of mind-boggling. There are several simplified eBook creators, often available for download from online print-on-demand services. The problem with most of them is they heavily rely on premade templates that are often not customizable to go with your requirements. With eBook Magic, Evergreen Ruby takes advantage of the excellent qualities of the iPad, offering users the possibility to use their photos to create personalized photographic ebooks. 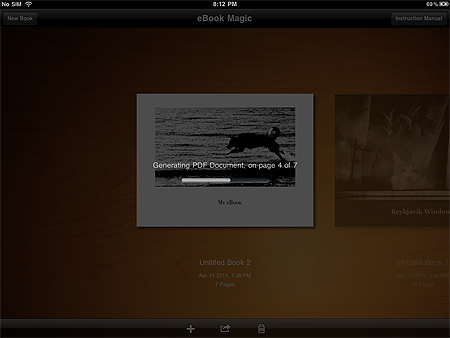 With eBook Magic, you can create photo books, which you can share or print, using photos saved in your iPad or imported from Flickr and Facebook accounts. Share to iBooks or email as PDF file. The app was especially thought as a photo book/photo album creator, but it is also possible to use it more simply as a more generic eBook creator. As other eBook software, eBook Magic was designed to be used also by beginners with no previous experience of eBook authoring. When you start the app you can add a new project to your gallery by tapping on the plus sign. As soon as you open your newly created project, you can choose right away a title for your work. Next step is picking a format among those available: you can go for landscape or portrait oriented books or you can choose the square format. The size assortment is quite satisfactory, but since there is no universal standard when it comes to book dimensions, especially in the case you want to print at a later stage, make sure your choice is compatible with your printing options. You do not have to worry too much about these details at first though: you can make changes at any time. 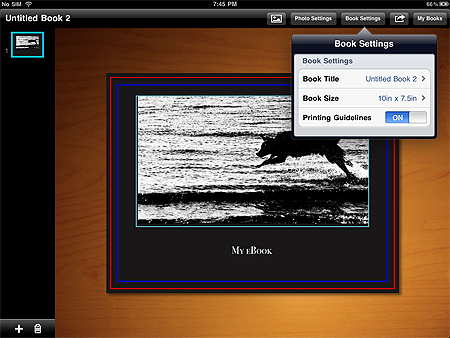 To assemble your book, you can import images from your iPad, from your Facebook and from your Flickr. 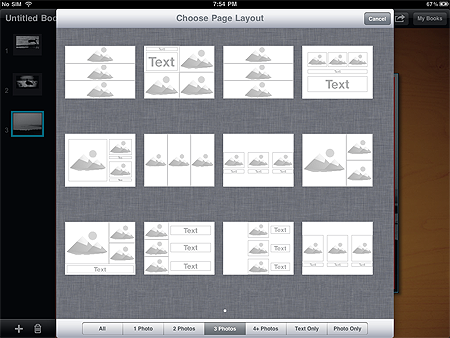 For every single page you can set a background and use different templates, in order to conveniently arrange your photos. It’s also possible to add text, both imported from external documents — by copying and pasting — and written directly from within the app. Images can have colored borders and be adjusted to the templates by pinching to enlarge and shrink them. You cannot rotate, flip or edit the images in any other way though, so be sure to use only photos that are 100% ready for use. Proceeding on a page by page basis allows easy reviewing of your work. You can make changes and rearrange the pages order as you see fit in any moment. It’s not possible to switch from a template to another after the page is created: if you want to change template, you have to create a new page. Using the “Set to default” feature, you can adopt your custom settings for the whole ebook instead of repeating the same process for each page individually. To have an idea of how your project is actually proceeding, you can generate a PDF preview. The easily accessible preview is especially handy to know at any stage of your creation process what are the details that need to be changed, how your photos will look on your final ebook, and so on. There are a few details about this app that in my opinion would be worth changing or improving. First of all, the fact some customizable elements aren’t really that customizable. The lack of possibility to handpick colors for backgrounds and for fonts is one of the aspects I am referring to. For instance, I noticed that the black color you can choose from the color panel doesn’t really appear to be pure black, so it didn’t go well as a background with the photos I had selected. I could have tried creating a black image to use as a background instead, but having to resort to this workaround just for selecting colors seemed kind of ridiculous. I’m not even sure if this solution would have worked or not. Also, this app is crash prone for me. 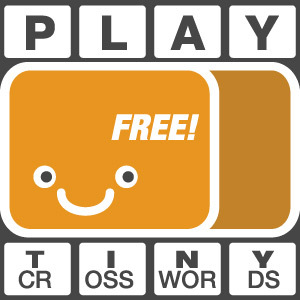 I tested it on iPad, so it could be things work smoothly for iPad 2 users. Apparently, working with high resolution photos (2500+ pixels, 300 dpi images) easily triggers memory issues, causing the app to crash after just a few minutes; this happened to me especially while adjusting text on pages containing both text and photos. Finally, ready-to-use templates inevitably cause trouble with cropping. You can zoom in and out to adjust the cropping a little, but making it work all right inside the templates, if you have photos that are cropped to the millimeter, is very hard — if not impossible sometimes, especially in pages that are supposed to contain more than one photo. Still, it must be said this app definitely brings value to iPad users that are into photography. eBook Magic is a fantastic app that, thanks to an uncluttered interface, great ease of use and fair customizability, will undoubtedly please those wanting to make use in a more practical way of their photography. eBook Magic is a valid alternative to many ebook creators like those you can download or access through several online print-on-demand services. From what I could see, this app is even better than those eBook creators, because to a certain extent it allows more flexibility. However, remember that full customization isn’t possible with eBook Magic, so it’s not advisable to completely rely on this app for creating professional eBooks. Compatibility: iPad. iOS 3.2 or later. Thanks for the review. These Apps still need some improvement such as being able to adjust pictures.